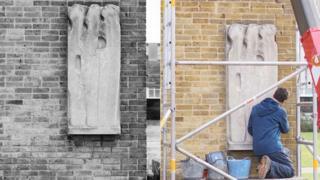 A sculpture has been removed from a university wall to bring pieces by a leading 20th Century artist together for the first time in 70 years. The work by Barbara Hepworth was taken from the University of Hertfordshire to form part of an exhibition at St Albans Museum. It had been embedded on a façade since 1952 and has been "painstakingly conserved", the university said. The works by Hepworth, who died in 1975, are on display for six months. Sculptures, drawings and archive material from 1948 to 1953, when the connection between Hepworth and Hertfordshire developed, are included. They have not been seen together since they were first created in her studio in St Ives, Cornwall. Co-curator Annabel Lucas said it was a "short, yet significant period" in Hepworth's life when she was commissioned to produce the public artworks in the county. "She had her first publication, a first film of her was made, she did her first theatre design and she took on public commissions," she said. "This is a real opportunity. There's a story to tell and artwork to share with local relevance and national significance." Vertical Forms, the piece commissioned in 1951 for the new Hatfield Technical College, was part of the county council's policy of dedicating a percentage of its budget to art. After the exhibition, it will return to the university in a new internal space to prevent further weathering. Another piece on display is Eocene, a sculpture also bought by the Hertfordshire Schools Collection and most-recently on display at St Albans Girls' School. Ms Lucas said: "The county council's policy brought real art into the lives of children so this exhibition continues the ethos - we want to share the best outstanding art in Hertfordshire with free access."